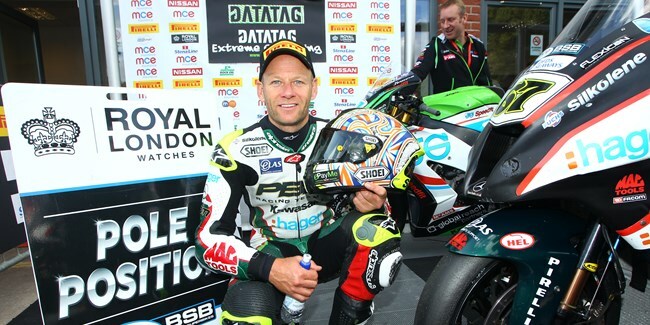 Shane 'Shakey' Byrne celebrated his return to the front of the MCE Insurance British Superbike Championship in style by setting the fastest ever lap of Oulton Park, heading off Tommy Bridewell and James Ellison to claim pole position. The fortunes of the defending champion were in complete contrast to his arch rival Josh Brookes who will start from the back row of the grid after a technical problem. Byrne had been pushing for the top of the times throughout free practice yesterday against title nemesis Brookes, but it disaster struck the Milwaukee Yamaha team when the championship leader encountered an engine problem on his out lap of the opening Datatag qualifying session to sideline him from the remainder and putting him in 30th position. Peter Hickman was the first of the riders battling for a Showdown position, crashing out of Q1 which puts him 24th on the grid for the opening race this afternoon. It was a painful end to Q2 for the returning Stuart Easton who crashed at Cascades, he was able to get up and walk away and the injured Scot has been passed fit to ride for the opening race. The closing moments of Q2 continued to be fuelled by drama as Showdown contenders Michael Laverty, Richard Cooper and Easton subsequently failed to make the cut for the top ten and make it through to Q3. They will start in 11th, 12th and 20th respectively. Q3 saw Byrne up the pace again and the PBM Kawasaki rider set a string of faster laps to hold off a closing Bridewell as the Tyco BMW rider returned to the front row as he bids to cement his position inside the top six. Bridewell was narrowly ahead of Ellison who surprised even himself with his performance on return from injury to hold the final position on the front row. Danny Buchan will head the second row for the Be Wiser Kawasaki team ahead of Cadwell Park podium finisher Billy McConnell and Luke Mossey, as the MCE BSB rookies fill the second row, split by the reigning Supersport champion. Jack Kennedy was seventh fastest for Team WD-40 Kawasaki ahead of Christian Iddon on the Bennetts Suzuki and Dan Linfoot. The Honda Racing rider remained ahead of John Hopkins who suffered a technical problem with the Lloyds British Moto Rapido Ducati with five different manufacturers in the top ten. Shakey said: "We have had a few tough rounds and I have said all along that we had been going through a bit of a rough patch and everyone has them. The work you put in away from the track both mentally and physically takes a lot out of you, but every time I have had a bad round I have gone away and worked harder as I am a firm believer that you only get out what you put in and it has been quite frustrating. "After Cadwell Park the team had a massive re-jig with everything; we have a new motor, new chassis and the bike steers and go round corners like it is supposed to! When we couldn't do that at the last few rounds you would have to say that something fundamentally wasn't right and I think the boys have found the problem and built me a new bike. From the first laps yesterday I was all smiles so I am absolutely made up with life and we have been getting stronger all weekend. When asked about his rival Josh Brookes starting from the back of the grid Byrne joked: "That was my voodoo doll! No at the end of the day I need to score podium points and I need to do that no matter who is in the race or where my rivals finish. Josh has had an incredible run and he has been riding at another level as nobody has really had an answer for him in the last few rounds which being perhaps his main rival has been a bitter pill for me to swallow. "But every time I go away and train I know we have to push harder and hopefully we have turned it around now. It would be cool if Josh was on the front row and a few of us could have a proper battle and give everyone else what they want to see - a fight for the race win. I have had my fair share of bad luck recently so I will take that pole position all day long."